I know, it’s been a while since we’ve reached out. We apologize for our absence. It’s February 1st and we want to make 2019 the best year ever for Stain Solver, but Kathy and I need your help. Would you take a few moments and share with us a tiny story or two? Maybe you even have a photo to go along with it. We’d like you to tell us any unbelievable tales about how Stain Solver worked for you? You know, what did you think was ruined but Stain Solver magically restored it and SAVED the day! Your story, or stories, will help us convince others about the power of Stain Solver. We’d like to share your success stories at the Stain Solver website. You know, as we do, that Stain Solver is a fantastic product. Let’s try to help others save their things with Stain Solver! If you belong to any online groups or do social media, Kathy and I would really appreciate you sharing your stories there as well. Your friends trust you so help them get rid of stains the way you do by telling them how well Stain Solver works. Thanks in advance for anything you can share. P.S. If you have any ideas that you feel will help us grow Stain Solver, we’d love to hear them. Just reply to this message. Red wine gets spilled, gravy slops and blops onto tablecloths, cranberries drop onto chairs. Stain Solver can SAVE your new carpet, heirloom tablecloth, chair cushions, etc. Use the following promo code to get 10% off any purchase greater than $29.00. Do you have questions about how to clean anything? Reply and we’ll help. We want to let you know we’re very thankful for your trust and continued business. Stain Solver is a very small cottage business and your purchase helps us keep the doors open. P.S. If you’re looking for practical Stocking Stuffers for Christmas, this sale is a GREAT TIME to purchase a case (12 bottles) of our cute sample size. Everyone can use some Stain Solver! This is a LAST CALL announcement for the Stain Solver Labor Day SALE. I got busy last week and forgot to send this out. The sale ENDS at MIDNIGHT Eastern Time September 11th. We’re a week into June already! WOW! Kathy and I have got a FLASH SALE on the 9-pound size going. Remember, this sale is ONLY FOR the 9-pound size. The promo code this time reminds me of Las Vegas and slot machines. When you place your order and notice the amount you saved, it will all make sense. We only have about 500 of this size in stock. If we SELL OUT – and that’s entirely possible – we will not have them in stock again until the middle of July at the earliest. So BUY NOW and don’t get caught without it. The sale ends soon, or when we’re out of stock. Algae. You hate it, don’t you? You may we wanting to clean LOTS of things outdoors now that the weather is warmer. Wretched algae might be on all your outdoor stuff. I created a new page at StainSolver.com for you that has larger photos AND a video showing you how to clean algae off ANYTHING outdoors. CLICK HERE to see the photos and watch the VIDEO. Please pass this email around to all your friends, neighbors, co-workers, relatives, etc. Because many may consider using chlorine bleach outdoors to clean algae. Chlorine bleach is the WORST THING YOU CAN USE to clean anything outdoors. It’s toxic and will systematically KILL all vegetation and large trees when you rinse it off the things you’re cleaning. My neighbor in Cincinnati, OH, KILLED a magnificent maple shade tree that bathed her patio with glorious shade. 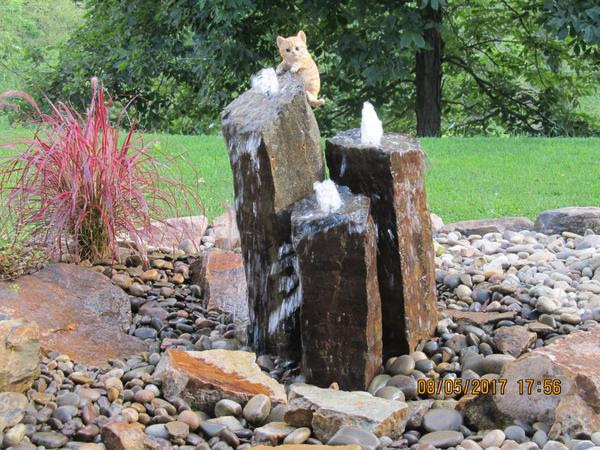 Every spring, she would dump three or four gallons of straight chlorine bleach on the patio stones and then scrub it in. I warned her, but she always thought she was smarter than me and she ignored my advice. Tsk tsk. After ten years as the tree slowly died, I remember the day the arborist came to cut it down. I had him come over to my house to tell him why it happened. He had no idea she was using toxic chlorine bleach around the tree. CLICK HERE NOW to ORDER MORE Stain Solver. I don’t know about you, but I want to stay healthy. I keep my coffee warm each morning in a stainless steel travel mug. I wash it after each use, including the leakproof cap. 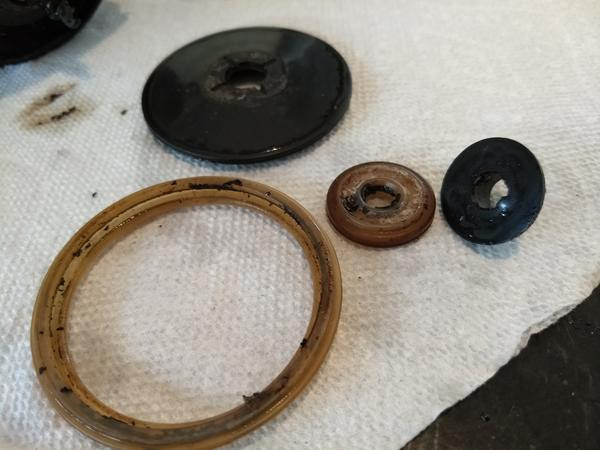 But look at this photo below of the cap parts after I took it apart yesterday. Do you see all that NASTY coffee sediment on the silicone seals? The black plastic parts had it too, but it’s tough to see in this photo. This is a unhealthy CRAP trapped in the parts that my scrub brush and Dobie pad can’t get to. I’m lucky I’m not SICK! Common sense tells you bacteria was growing in this organic goo and gunk. CLICK HERE to see other photos and a VIDEO showing the magic cleaning bubbles of Stain Solver at work. You’re NOT GOING TO BELIEVE the after photos and how clean the coffee mug was after just a few hours of soaking. CLICK HERE to see all the before & after photos and the video. Please FORWARD this email to anyone who drinks coffee or tea from mugs or brews it in some hard-to-clean machine. Forward it if your loved ones use any type of food processing machine that’s hard to clean. You might prevent an illness because Stain Solver can CLEAN all the parts with ease removing the food that can harbor bacteria. Do you have a Vegematic food processor or juicer? You can clean these the SAME WAY you see in the VIDEO on this page. Watch to see how the magic bubbles scrub on their own. Questions?? Just reply and I’ll help. STAY HEALTHY! Soak things in Stain Solver! CLICK HERE TO REORDER MORE STAIN SOLVER OR TO SEND SOMEONE YOU LOVE A CARE PACKAGE TO KEEP THEM HEALTHY. The End-of-Winter SALE is about to end. (Ended midnight 04/08/2018.) You know the drill. You can purchase any size you want. If you want 2 pounds, great. If you desire 4.5 pounds, awesome! If you covet a 9.2-pound container, you’re the best! If our 50-pound size floats your boat and you buy this size, I’d give you a big hug if I saw you in person! All that said, I can’t tell you when the next sale will be. If you don’t purchase a larger size right now, our 9 and 50-pounders, they MAY SELL OUT and you’ll be without. When you come to get one in a month you may see the Out of Stock message at the cart. That’s not a threat – it’s reality. The sale ENDS at midnight Eastern Time April 8, 2018. That’s Sunday night – tomorrow. You get 10% off any purchase greater than $29.00. You get FREE SHIPPING to the lower 48 states in the USA. Good Morning, at least that’s what it is here in central New Hampshire. The snow is melting and soon we’ll be swimming. The special End-of-Winter SALE is ending in days. I warned you that the larger sizes, our 9 and 50-pounders, might get low in inventory. Many people are buying those two sizes because they’re a BETTER VALUE on a price-per-pound basis. If you LOVE those two sizes you better BUY NOW. Your procrastination may cause you to see an Out of Stock message next week. Kathy, my wife, drinks a special cinnamon tea each night. I drink two cups of coffee each morning. 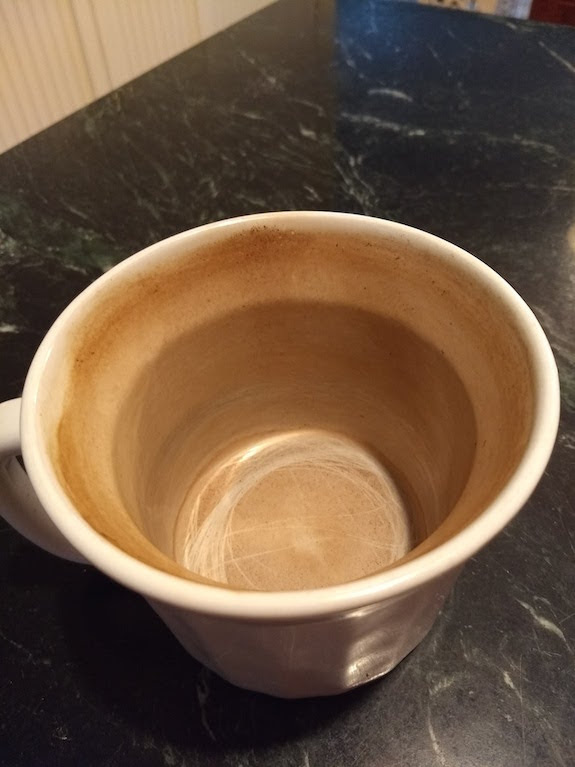 CLICK HERE to see how I cleaned the mug with NO SCRUBBING at all. Wait until you see the AFTER photo!!! Do you have questions about how to clean ANYTHING? respond to this email with your question and I’ll answer it. Remember, the SALE ENDS on SUNDAY. Thanks so much for subscribing to the Stain Solver Newsletter. We’ll strive to show you new uses so you can clean many things around your home with magic Stain Solver oxygen bleach. Some little person may get chocolate on your carpet, their clothes, your clothes, your upholstered furniture or ???? Yes, this weekend is probably the second biggest chocolate holiday just behind Halloween. Should I keep going? Do you want me to list MORE things to clean? Are you one of our customers that LOVES the 9-pound size? We just did a manufacturing run, but there are just SO MANY of this size in the warehouse. I’m serious. We can’t make more at the drop of a hat. The same is true for our 50-pound size. We have the LEAST NUMBER of 50-pounders available. If you like to purchase Stain Solver in larger quantities and you don’t want to RUN OUT and be disappointed to see the OUT OF STOCK message at the shopping cart, then BUY NOW. I’m not using this as a scare tactic – I’m telling you the truth. ORDER NOW so you’re not left out. 10% off all sizes except the small sample size. FREE SHIPPING to the lower 48 states. The sale will end in NINE DAYS. PLEASE ORDER ASAP so you’re not disappointed. Kathy and I are NOT yanking your chain. You must realize we have just so much packaged up to send out. Once it’s gone, it’s gone until we do another full-blown manufacturing run. Good Luck to you. We hope you don’t see the Out of Stock message!